“I hear you knocking but you can’t come in!” . . . .
By coincidence, I was in the basement reorganizing jars of last year’s canned goods to make room for the current crop when I heard a “scritch-scratch” noise coming from the window well. It was very difficult to see what was making such a commotion through 100-year-old window panes so stained you cannot see through the glass. I could observe movement and a shadow running back and forth, but could not see what creature might be in such a frenzy. I assumed we might have an eager pack rat trying to dig his way into the basement. We have had these pesky visitors before. They make a terrific mess and their downright thievery of a variety of small objects which they tuck into their nests is a nuisance. Dad had a solution and would go for his pistol. Sometimes it took several loud, booming shots before he would emerge victorious with a dead packrat. There are still bullet holes in the basement walls. I went outside to get a closer look and there was a fat, furry little brown creature with a long tail scuttling around frantically trying to climb out of the window well. It was too big to be a packrat, and I didn’t want to deal with it. I called for help. “Out of the frying pan, into the fire!” . . . .
Michael brought the live trap and after some maneuvering, was able to capture what was clearly a muskrat. But muskrats are water creatures. What was it doing so far from the pond, half a mile away? “There must be some mistake!” . . . . There was only one solution. Take it to the pond and hope that is where it lives. If not, it will perhaps find a new home more appropriate than a concrete window well. “There is no place like home . . . there is no place like home!” . . . . The muskrat took off down the bank of the pond as fast as its little feet would carry it. 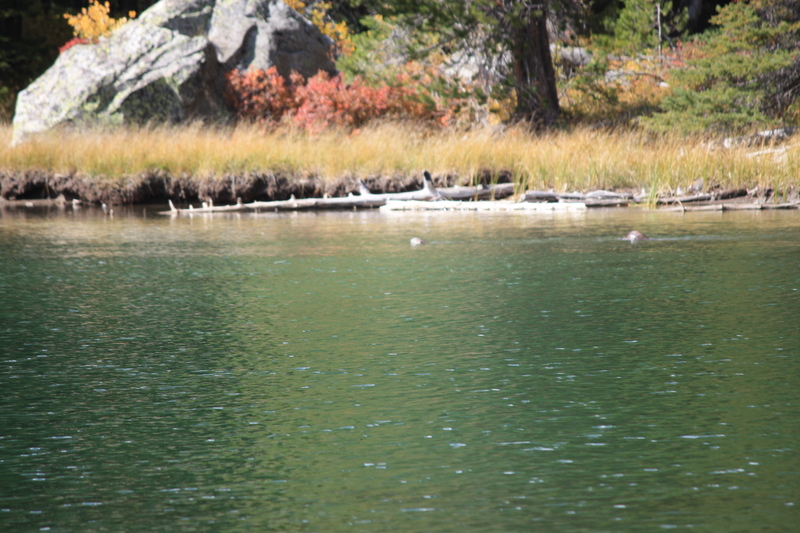 It seemed pretty familiar with the terrain and didn’t hesitate to jump in the water. It swam right to the den on the bank of the pond and disappeared from our view. A happy ending . . . .
Little Musky is home at last, and we hope he or she decides to stay put. We can only wonder what led it to our window well. Lover’s quarrel? Doing lunch? Checking out the real estate? Only Musky knows. “What’s for breakfast?” . . . .
July 4, 2016 Red Feather — Our day began with a visit from a Blue Heron across the road on Sam’s Pond. Calmly surveying the options for a tasty morsel, this grand creature stood quietly while I hung over the porch railing to grab a few shots. Many of the weekend visitors had already departed for home, leaving Red Feather on this Monday morning quiet and returning to some sense of normalcy. “Might as well try another perch” . . . .
“A good stretch feels good after a long standing” . . . .
“I think I can see a large bird in the water” . . . .
One last image captures the reflection of “Big Bird” and the Aspen trees nearby. It will be hard to find another image so magical on our walk, but the day holds much promise. A tangle of sagebrush and flowers . . . .
Wild flowers are at their peak right now, and it is a challenge to decide which clusters to include. Indian Paint Brush in a meadow of sage . . . . I located some seeds once, but didn’t realize they only grow with sage. My plantings didn’t survive. Dozens of different yellow flower varieties . . . .
Should have packed my wild flower guide so I could identify these. Ah well, next time! Sunflower . . . . There were brilliant clusters of sunflowers along the road and in the meadows. I will call these Lemon Drops . . . .
Perhaps a study of the predominant colors of wild flowers will reveal that “yellow” wins. Bright and cheerful, the yellow varieties stand out in the crowd. Blue is special . . . .
My personal favorites are the blues. White is nice . . . .
White with happy faces . . . .
Didn’t want to disturb the insect perched on board, as it may be a pollinator. Looked like a very small wasp or bee-like creature. Wild roses blooming everywhere . . . . These little pink roses are ubiquitous and the hips will be food for the bears. Oh Columbine! . . . . Nothing is prettier than the Columbine, Colorado’s state flower. I grow them in my garden at home, but they don’t seem as vibrant as these found in the wild. Blue treasure . . . .
A camera fails to capture the true blue of these extraordinary flowers, but we keep trying. A prickly discovery . . . .
Not to be left out, a thistle is also nature’s creation. Pesky, invasive and labeled a “weed,” it gets no respect. But it is an interesting specimen! A little lavender . . . .
A little pink . . . .
A little green . . . .
A little water . . . .
A lot of ducks . . . . Eight babies seems like a tremendous challenge, but this mother calmly leads the way and her ducklings stay in formation. Three Sisters . . . . This iconic rock formation juts into Hiawatha Lake and catches the evening sun as it is going down. “Shhhhhh! Enter quietly” . . . . It wouldn’t be a walk without a trip down Elf Lane. This gentle reminder invokes a special respect to avoid disturbing all the gnomes, elves and other little creatures sprinkled through the rocks and along the creek. Literary elf . . . .
Loafing elf . . . .
Elves galore . . . . The babble of a brook . . . .
Sundown . . . . Returning to the cabin, the evening sky put on a show of its own. One spectacular day. 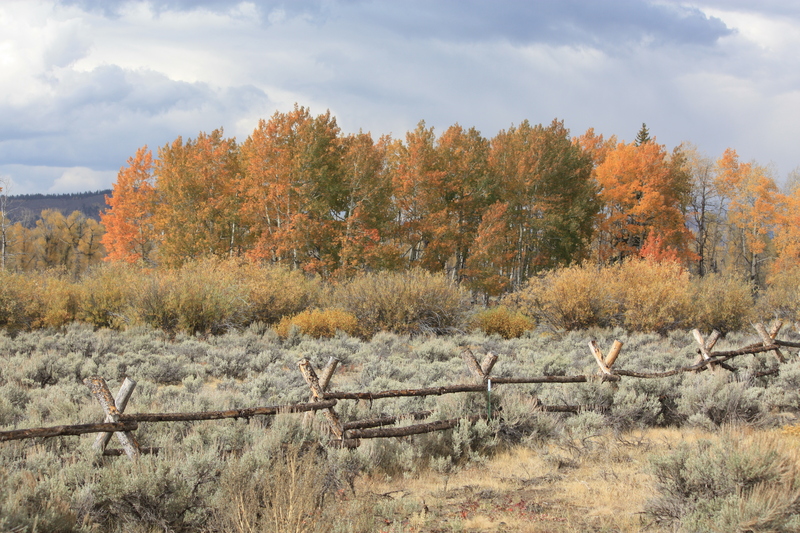 Like no place on earth . . . .
Our annual autumn trek pointed north this year to explore the fall colors in Wyoming. 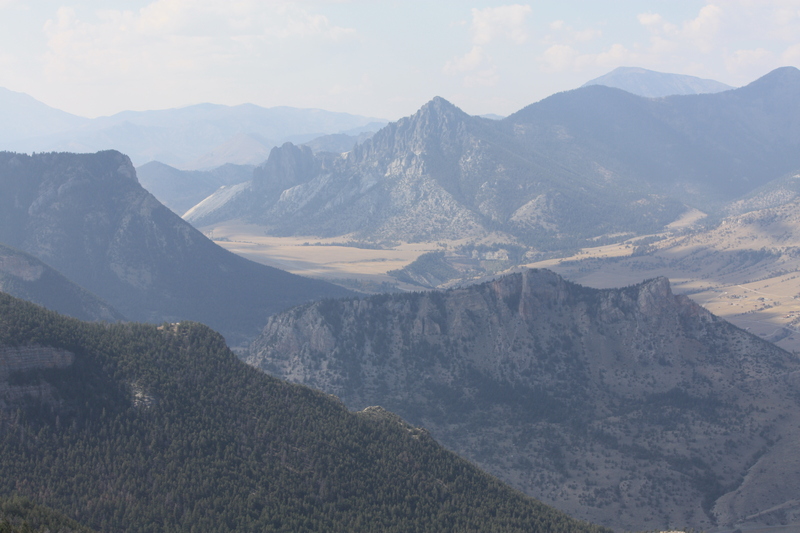 We take for granted some of the most spectacular vistas in our home state, and it was rewarding to renew our memories of what makes Wyoming such a special place. 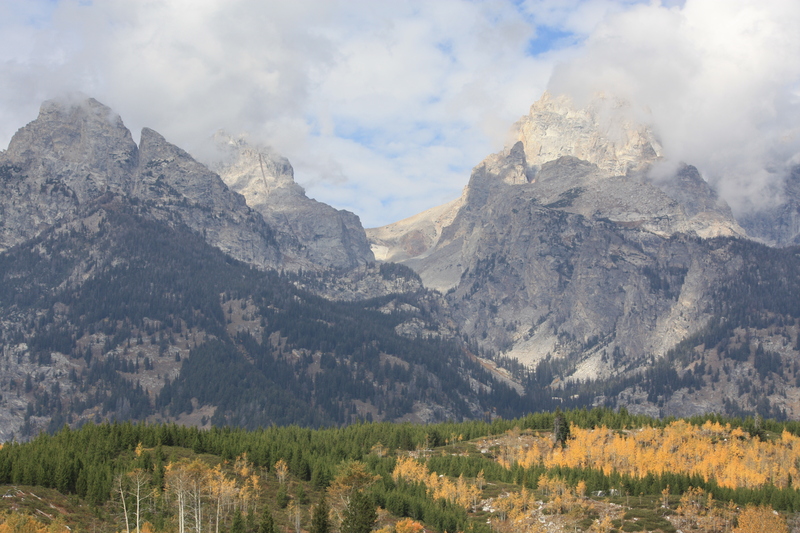 We spent a pleasant evening in Jackson revisiting some old haunts, and headed out early the next morning to Teton National Park for some serious sightseeing. These terrible beauties are bathed in clouds as the weather threatened rain or, this time of year, quite possibly snow. 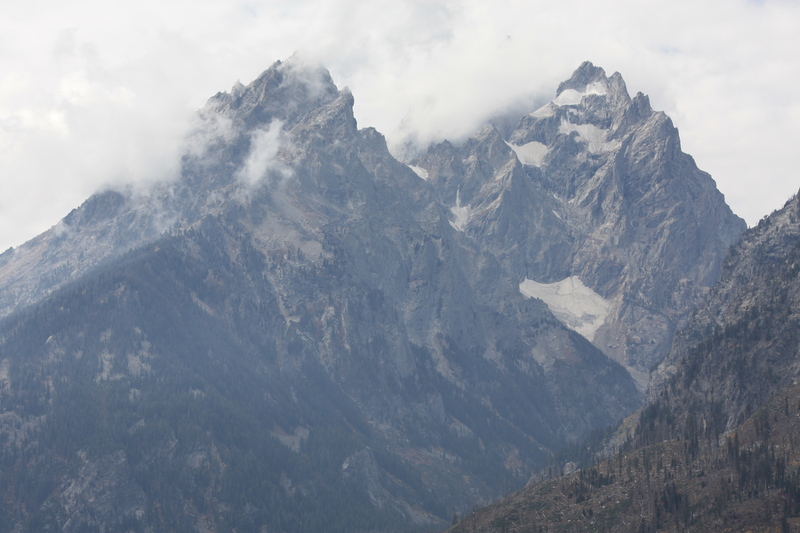 Fortunately, the sun prevailed but the clouds added great interest to the mountain peaks. 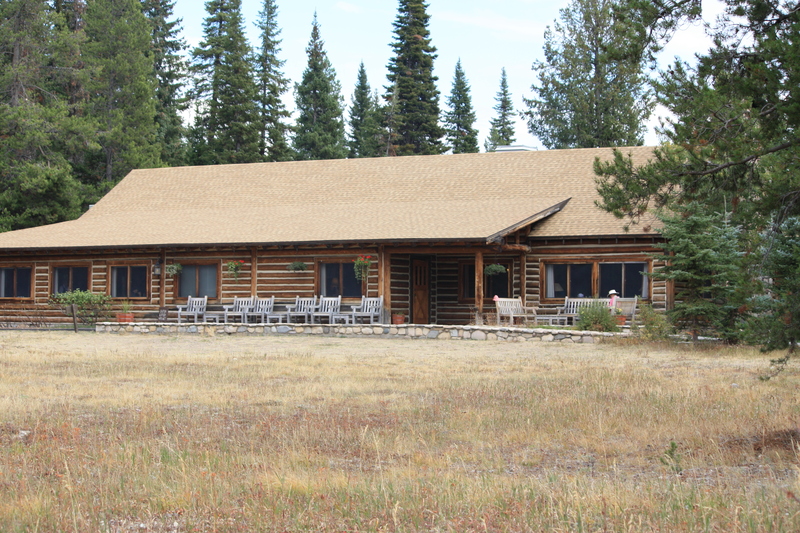 Still the same, after all these years . . . .
Jenny Lake Lodge and surrounding cabins is a family favorite. A photograph of Jenny Lake, taken by my father, hung in the family home for 50-plus years and I tried to duplicate his shot, to no avail. The sun wasn’t with me and I’ll have to try again, on another journey. What’s this–a stone’s throw? . . . . 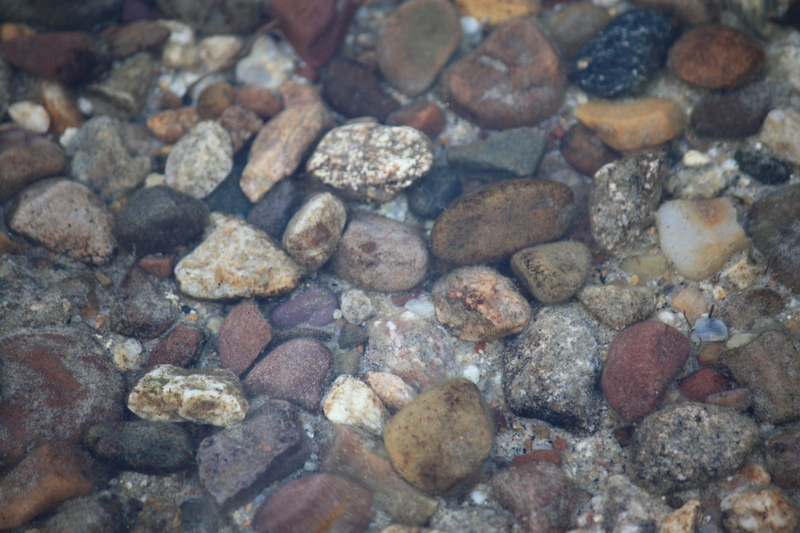 The clear, cold waters of Jenny Lake seem invisible and the rocks were so colorful I could not resist photographing them. My consolation for not getting a great image of the lake! “I’ll bet I can race you to the other side and win!” . . . . Racing river otters provided entertainment for a picnic lunch at String Lake, which is a narrow channel between Jenny and Leigh Lakes. Wildlife shots are never easy, and a stronger lens is needed to do this justice, but I had to try. River otters are fairly reclusive and a chance sighting was rare good fortune. Cruising up the river on a sunny afternoon . . . . 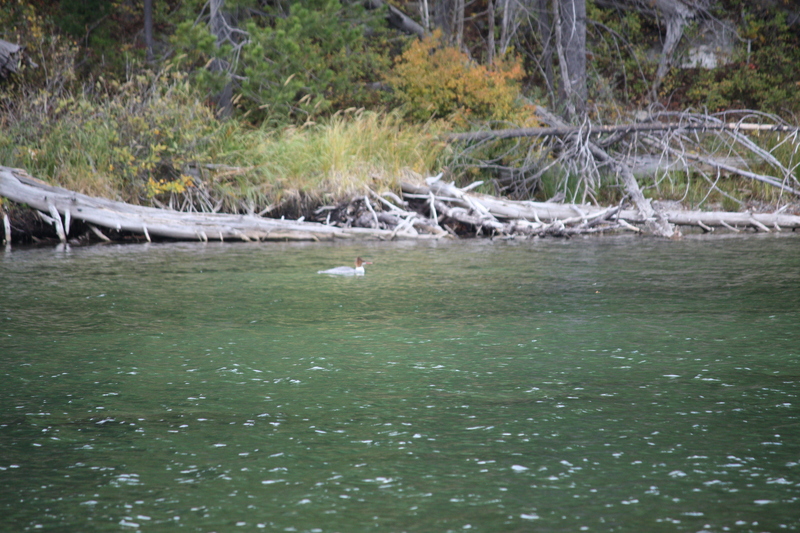 This common merganser duck was another great sight at String Lake. Multitudes of ducks, geese and birds ply the rivers and lakes, but this duck stood out in the crowd. 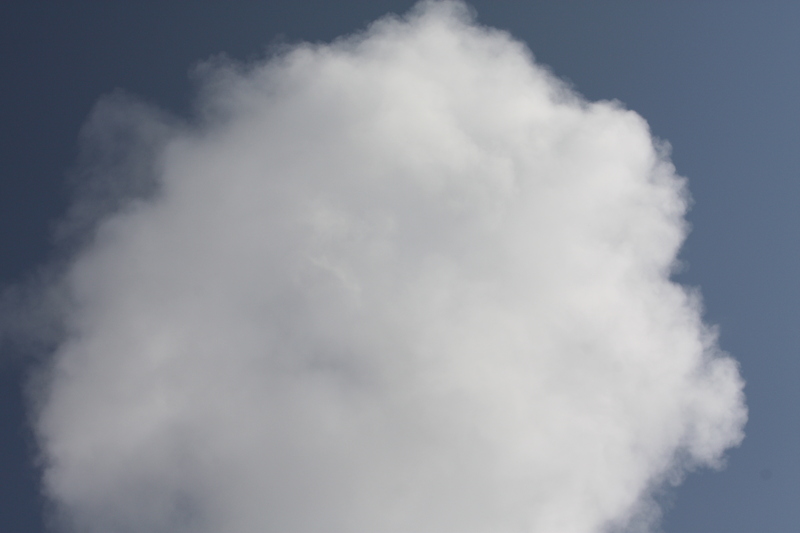 Clouds hovering over Jackson Lake . . . . The cloud cover arrived in time to catch a shot at Jackson Lake. 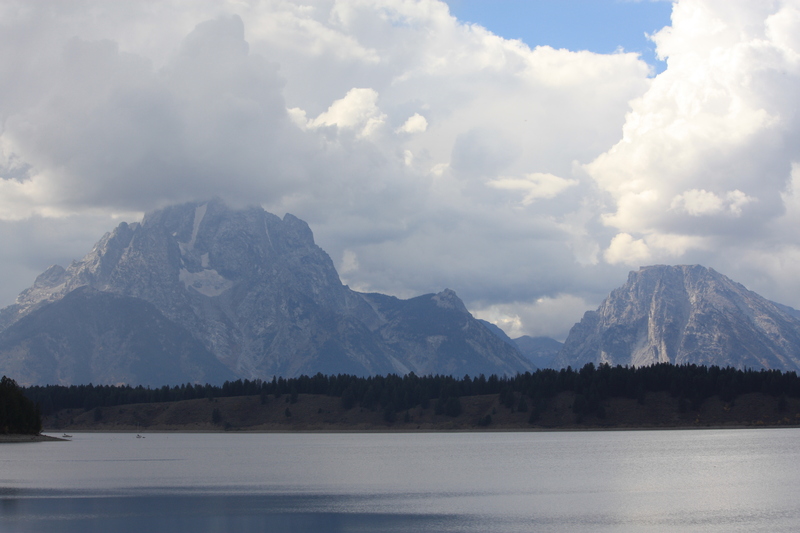 It was hard to choose which was the more beautiful–the Tetons or the clouds above them. 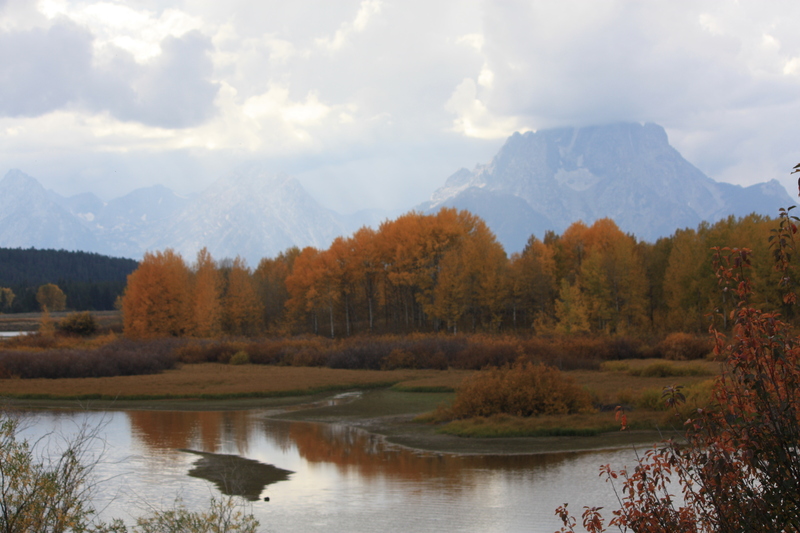 Oxbow Bend beyond belief . . . .
Just beyond Jackson Lake Junction, we came to the Snake River at Oxbow Bend and the colors were so intense it took our breath away. Clouds obscure the peaks, but afford a softer light on the river. Hated to leave this lovely spot behind. On the road again . . . .
Our journey takes us north to Yellowstone National Park where we plan to spend the night at Yellowstone Lake which formed at the center of a great caldera. We are hopeful it will not erupt for another few thousand years. About 2 million years ago, and then 1.3 million years ago, and again 640,000 years ago, huge volcanic eruptions occurred here. The last eruption spewed out 240 cubic miles of debris. Too close for comfort! The central part of what is now the park collapsed, forming a 30- by 45-mile caldera. Beyond imagining. If this is Lewis, where is Clark? 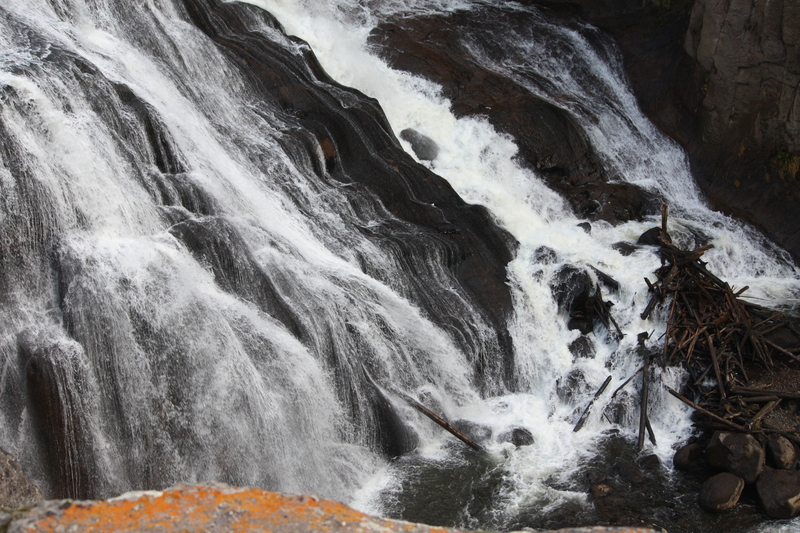 . . . .
A roadside attraction, Lewis Falls is the first of a number of spectacular water falls in the park. 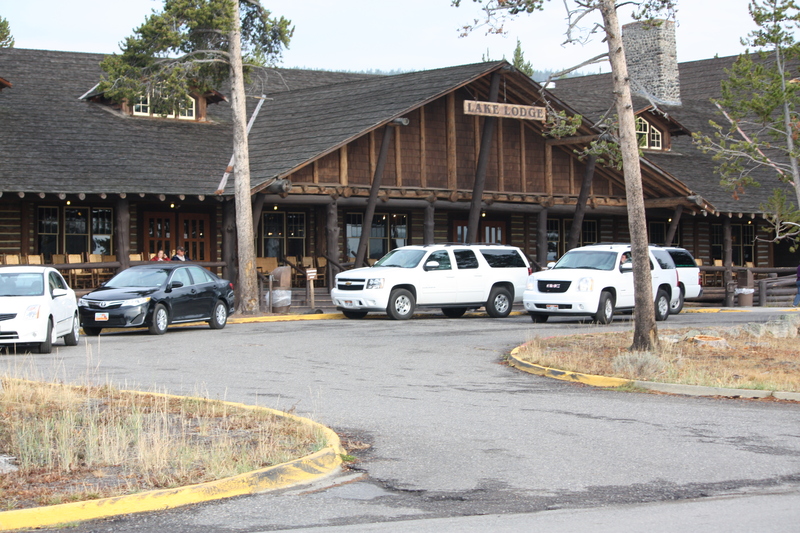 In the grand tradition . . . .
Yellowstone Lake Lodge check-in was required for our cabin, which was a delight. 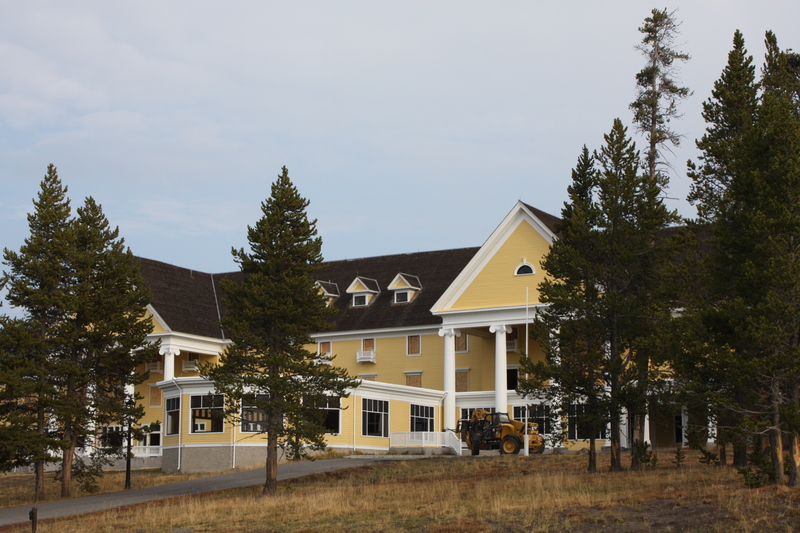 This lodge and the cabins remain open until the end of September, however the grand old Yellowstone Lake Hotel was closed for the season. One of the world’s grand old hotels . . . .
Yellowstone Lake Hotel is so immense it has to be photographed in about six sections. This is the primary entrance and the boarded windows will protect it from the harsh winter that will soon arrive. Crews of maintenance workers were crawling literally over the length and breadth of the hotel to make repairs and secure the site for winter. The only regret of the journey was that we could not book a room here. Ah well, next time. Our cozy little cabin was a delight and a great value. An architectural icon . . . .
No rubber tomahawks for sale today. We can only imagine what wonders await the visitors next year in this fine old store. Where’s my breakfast? . . . . 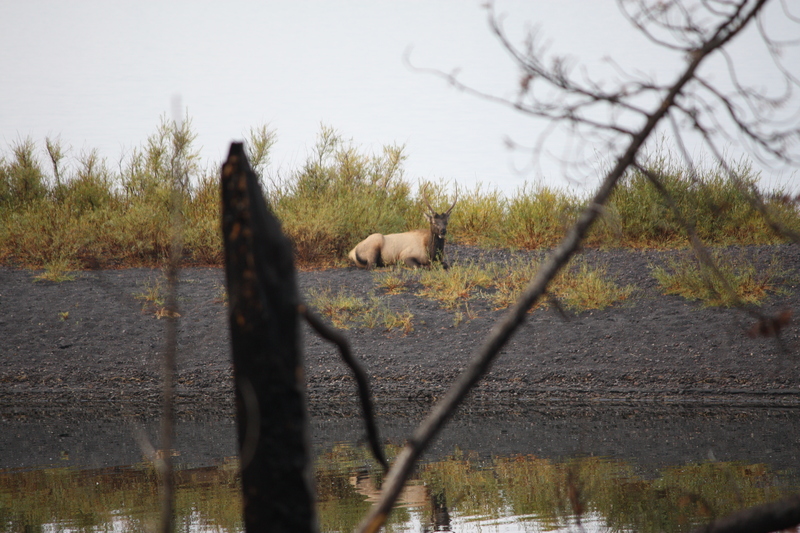 This young bull elk was enjoying a respite on a sand bar along the edge of Yellowstone Lake. Three cow elk were holding court nearby in case he needed any female attention. 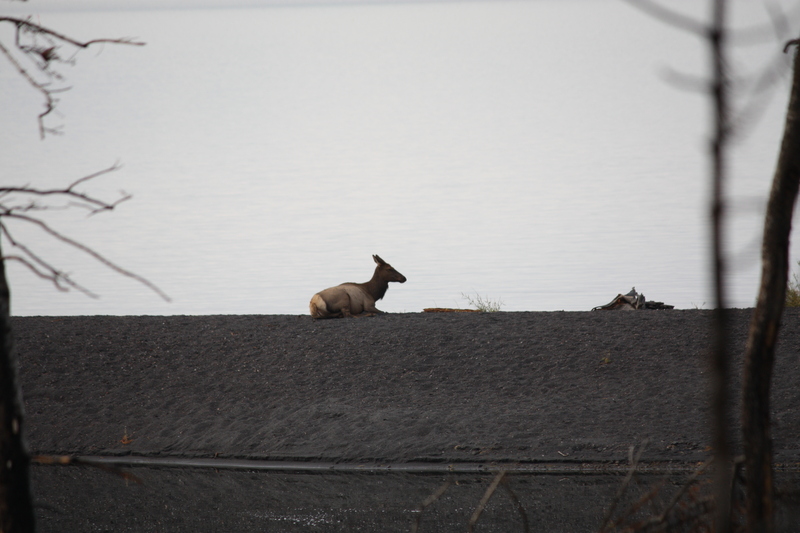 The lady of the lake . . . .
She seems to enjoy her repose a short distance away from the male elk. Life is sweet for this moment, and a wolf sighted up the road a short distance from her is not likely to pose a threat today. The wolf moved into the brush too quickly for us to get a clear view of him, and it was a great photo loss. 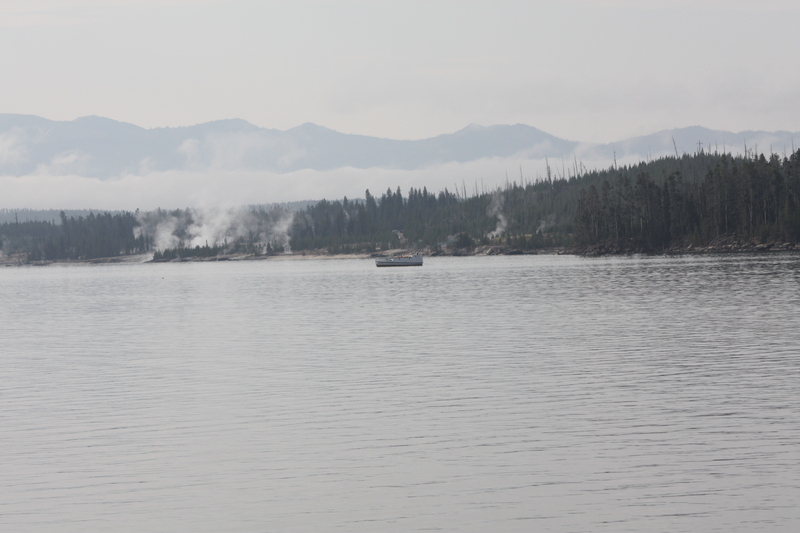 A tiny little boat on a great big lake . . . .
Hydrothermal steam rises from the shoreline of Yellowstone Lake, North America’s largest high-altitude lake. Twenty miles long, 14 miles wide, 410′ deep at its greatest depth, and 141 miles of shoreline. The lake bed is a volcanic caldera that is constantly monitored for seismic activity. 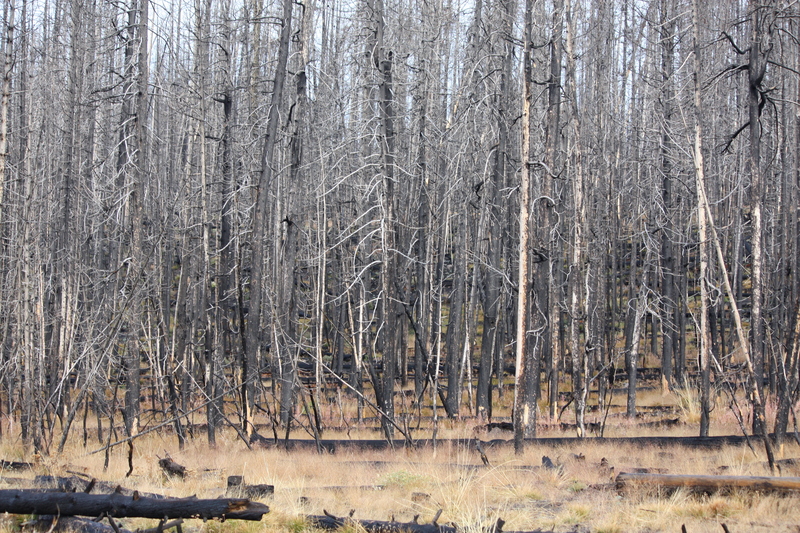 The ubiquitous burn . . . .
Fire leaves its mark on the forest, and Yellowstone has many fires throughout the years. Fortunately, not many are as devastating and threatening to historic structures as the “big burn” of 1988.
just a humble log cabin . . . . 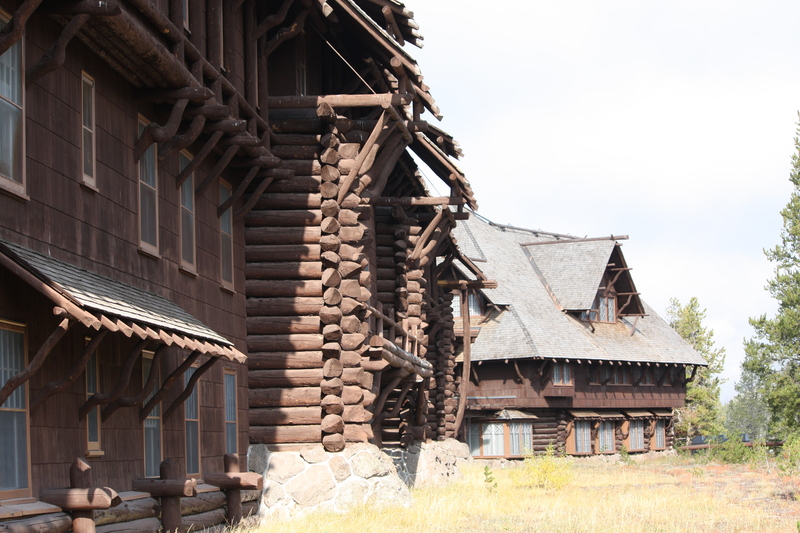 This intersection of Old Faithful Inn is interesting to understand the log construction of this massive lodge, which is described as the largest log structure anywhere. 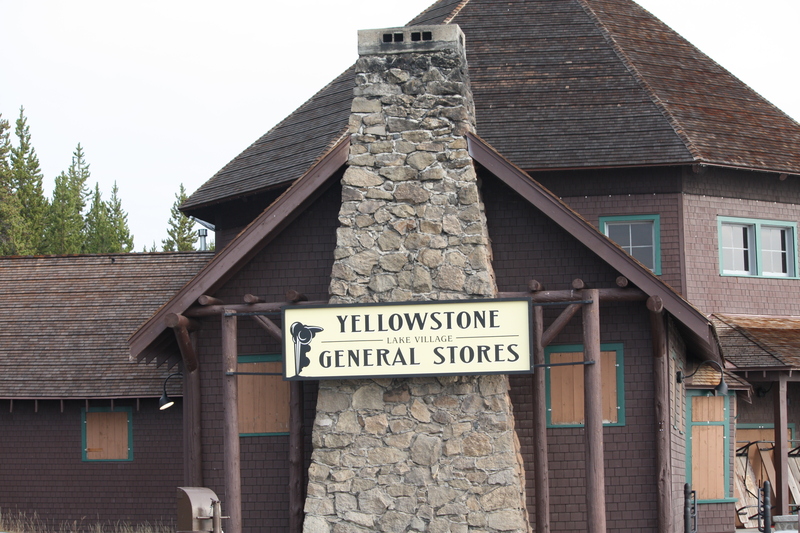 Our favorite viewing site for the Old Faithful geyser is on the second-story deck above the entrance. Armed with a steaming cup of coffee and warmed by the morning sun, it made for perfect viewing. Curly logs for support and decoration . . . . The deck also affords afternoon cocktails. As we waited for Old Faithful to erupt, I was reminded of an elderly man playing the grand piano inside the lodge on the mezzanine. Egad, that was about a dozen years ago now. The memory will stay with me forever, and I have struggled mightily to master one of the pieces he performed–Traumerei by Schumann. What a chimney–try building one of these! . . . . 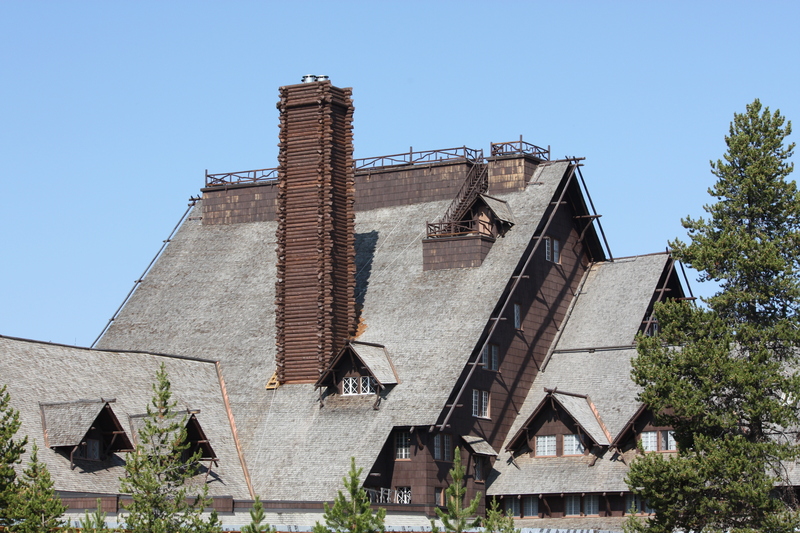 Even the chimney is clad in logs! This massive four-sided stone fireplace rises four stories high. Thar she blows! 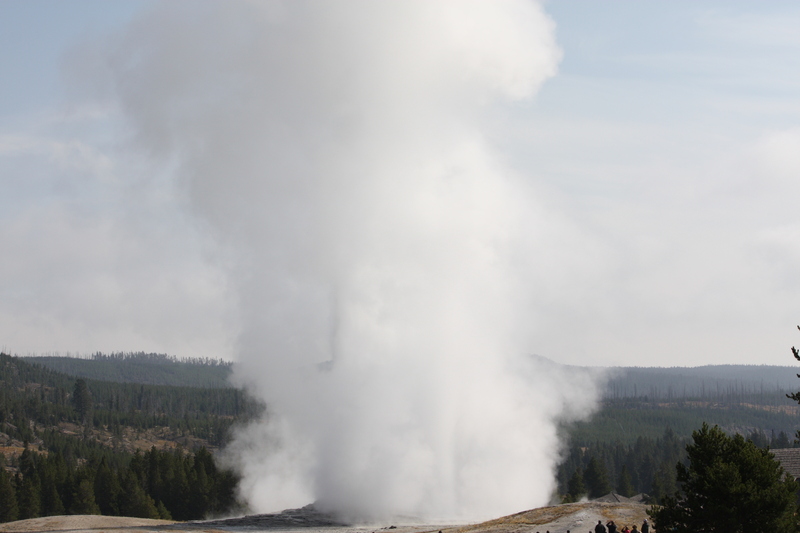 . . . .
Old Faithful never fails, and is truly a wonder to behold. My first sight of it was as a child, and I still feel the thrill as if for the first time. Up, up and away . . . .
Having journeyed through Yellowstone a number of times, the multitudes of geysers, thermal pools, mud pits and other wonders were not on our list of priorities. We did enjoy some along the way, but our greater interest was in viewing and photographing the wildlife. We realized soon enough that our itinerary was not conducive to seeing as much as we had hoped, as evenings are some of the best viewing hours and that requires planning and preparation. We learned from this visit, and will arrange our lodging and schedule for more early morning and evening viewing. Mudpack, anyone? . . . . This “painted pot” was just beyond Old Faithful Inn, and with easy access, seemed to call out to be included in our photo album. 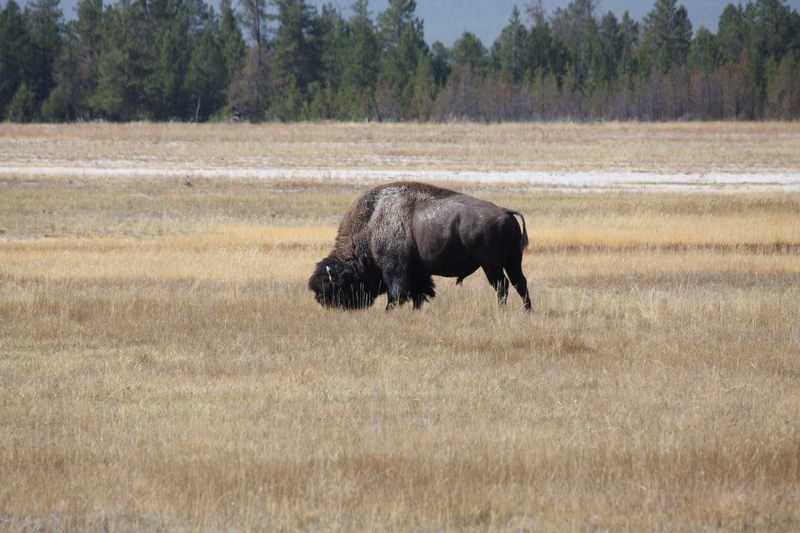 Nothing like a mud bath to keep the flies off . . . .
An old “hermit bull” bison grazes alone and far from the herd. 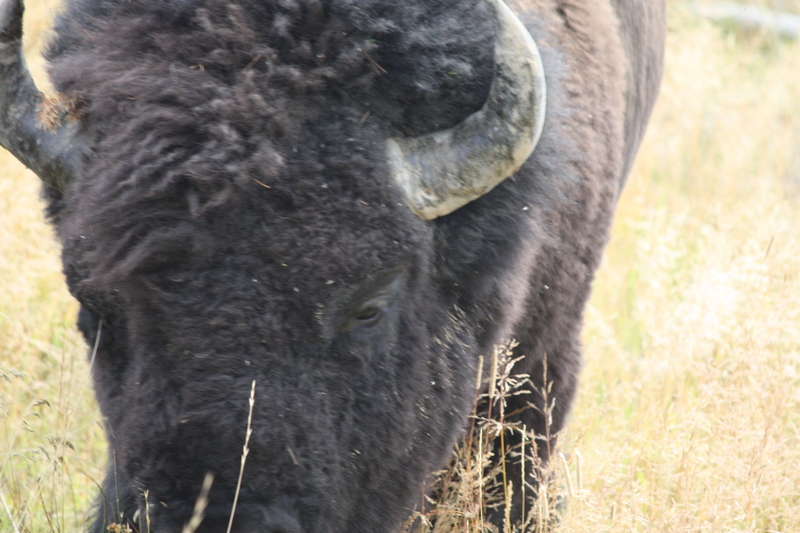 He has likely been displaced by a younger, stronger and more virile bull who now rules his harem of female bison. This old bull was lounging along the road and presented an opportunity for an “up close and personal” conversation. A little zoom brought him close enough to be out of harm’s way, however. just another waterfall along the way . . . .
A side trip to Firehole Falls led us along a spectacular canyon drive that we had never seen before. 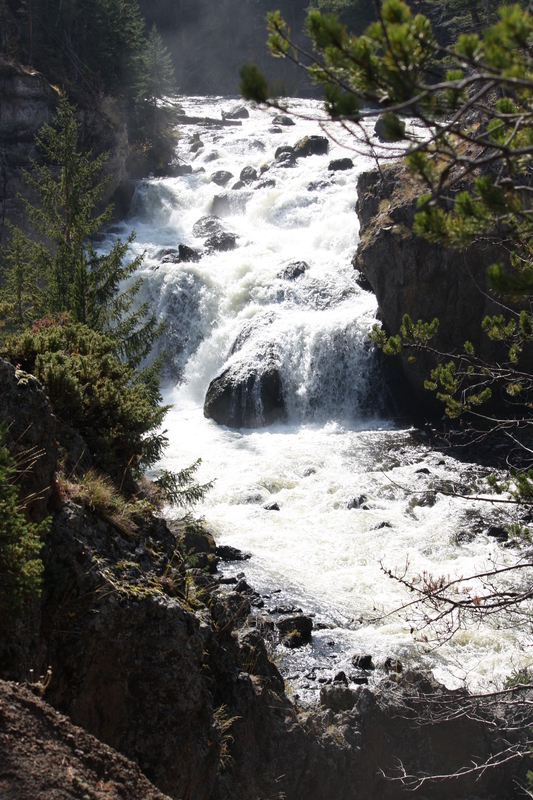 The Firehole River flows between two lava flows. 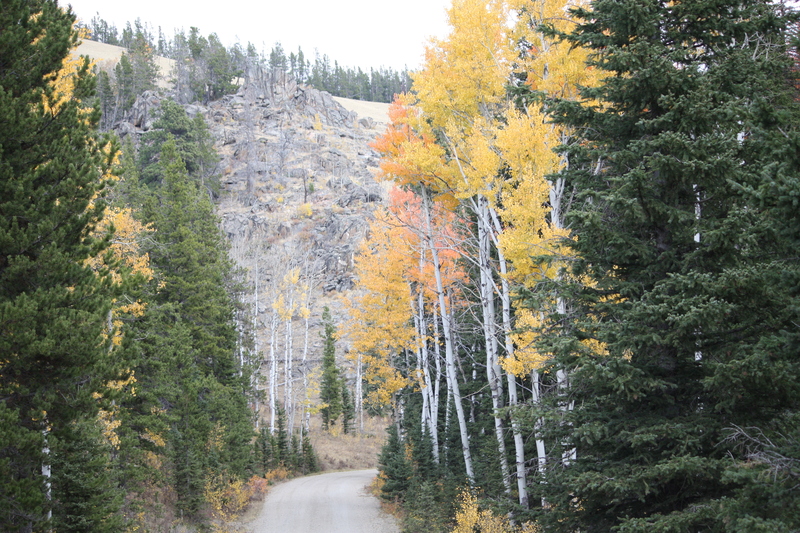 Impossible to capture on camera, we found this one-way stretch of road to be awesome. a log in the sun, wine, cheese and thou . . . . 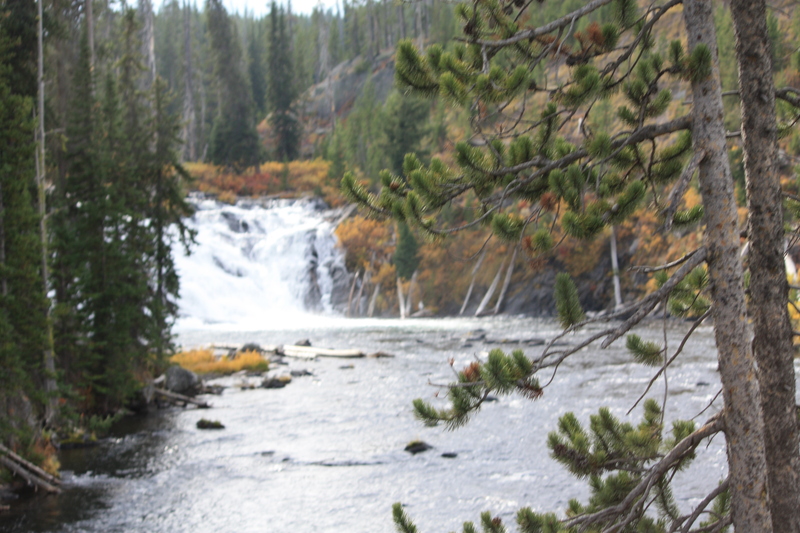 Lunch along the Gibbon River was a peaceful contrast to the thundering Firehole Canyon. 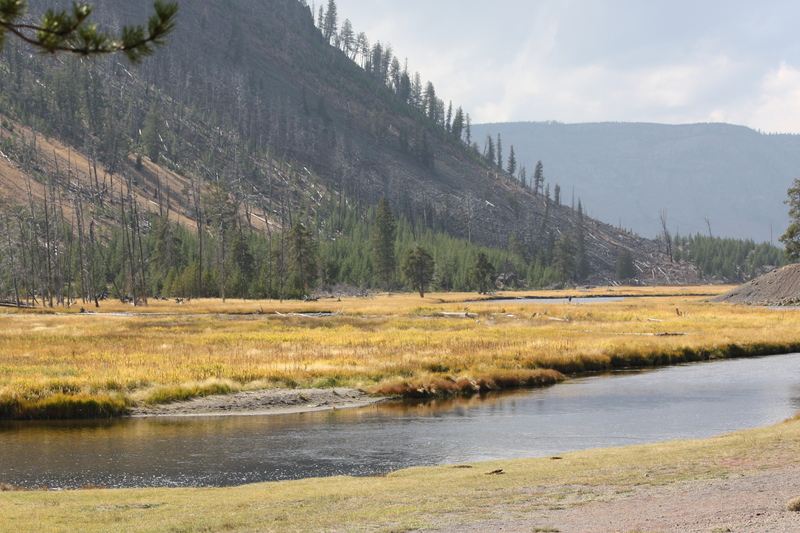 The Gibbon River joins the Firehole at Madison Junction, becoming the Madison River–one of three forks forming the Missouri River. An ampitheater, information center and the best restrooms in the park were nearby. About five miles further on, we came to Gibbon Falls. One waterfall is more beautiful than the next. Cannot remember seeing so many in a single day since touring the big island in Hawaii. oh for a better lens . . . . 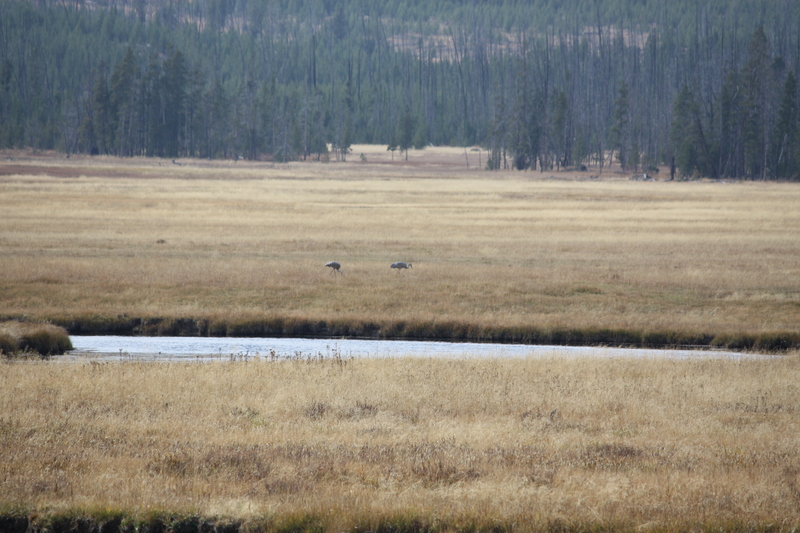 Sand Hill Cranes are grazing in a great meadow that is likely teeming with wildlife later in the day. We were torn, but had to travel on to our next destination. We noted this location for another exploration. I can see forever . . . . Nearing the north entrance of the park, late afternoon light on Electric Peak is quite lovely. So many mountains, so little time. Elk for dinner? 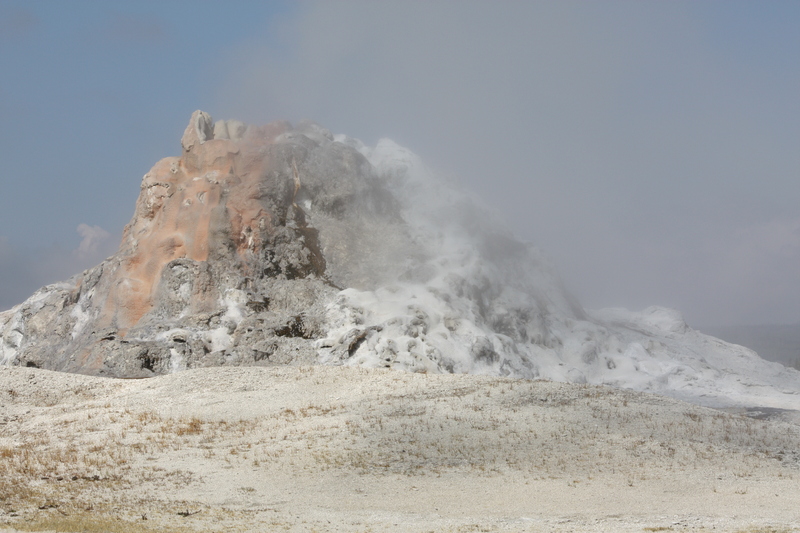 . . . .
Mammoth Hot Springs is the northwest entrance to the park. Late afternoons will find a herd of elk moving in for cocktails and dinner. We missed a shot of two great bull elk who were cruising the scene, but the cows were placidly grazing and hanging out. 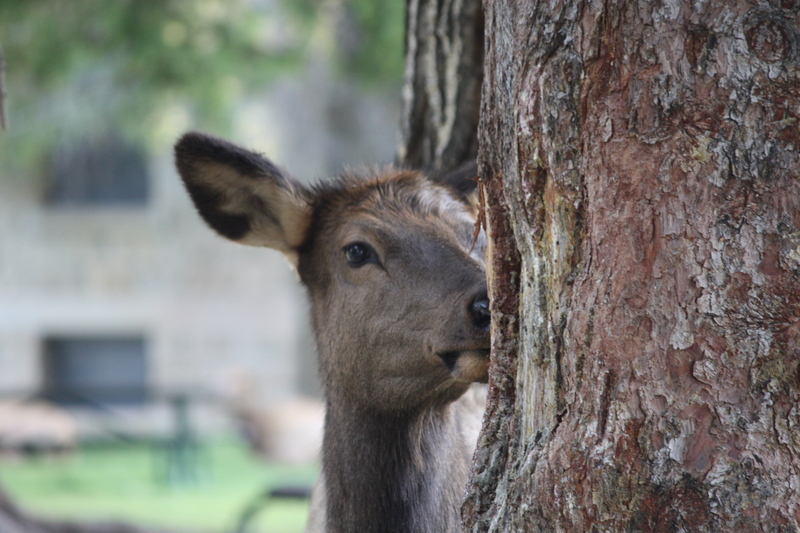 “Now you see me, now you don’t” . . . .
Peekaboo with an elk is good entertainment, as she kept peering from one side of the tree to the other. 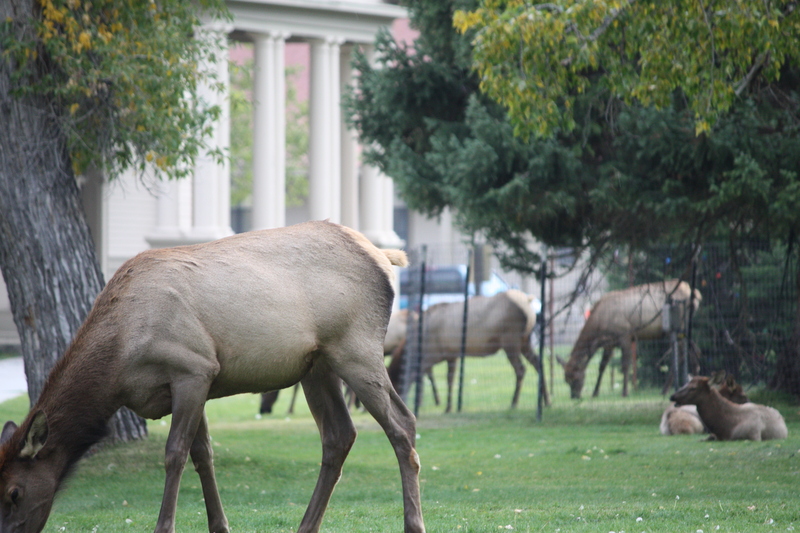 Park rangers were a little nervous to have the elk commingling with the tourists, and kept warning everyone to stand back. Just another day in the office! 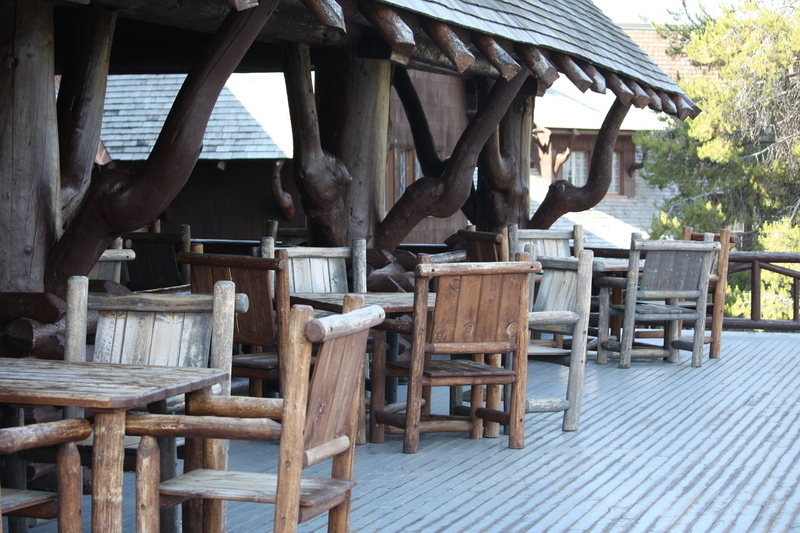 a little cabin in the wild . . . . 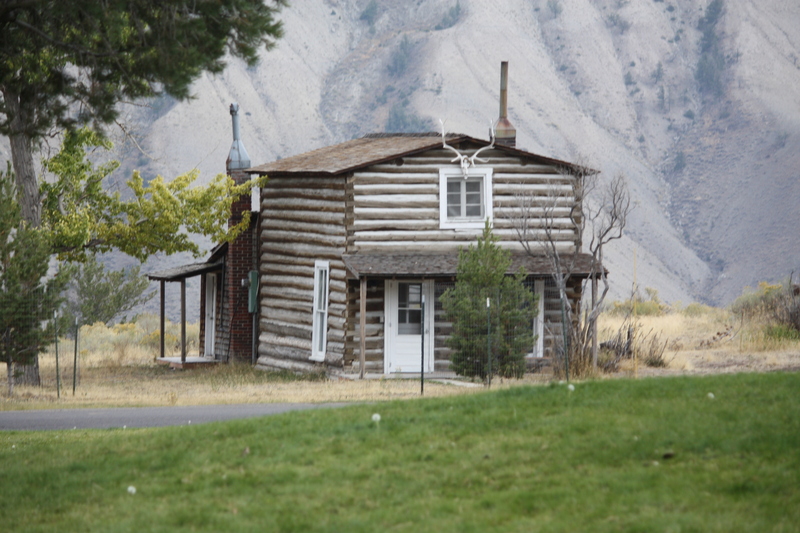 There are many memorable, historic structures at Mammoth, and this humble little cabin is our favorite, with the possible exception of the Roosevelt Arch. Yellowstone is the world’s first national park and was established in 1872 by President Theodore Roosevelt. The great stone archway that comprises the northeast entrance was dedicated to him. Great lodging north of the border . . . .
We left the park for a short drive to a truly unique retreat in the Absaroka Mountains of Montana. Chico Hot Springs Resort taps into 112-degree water which makes for delightful bathing for weary bones and cramped muscles. 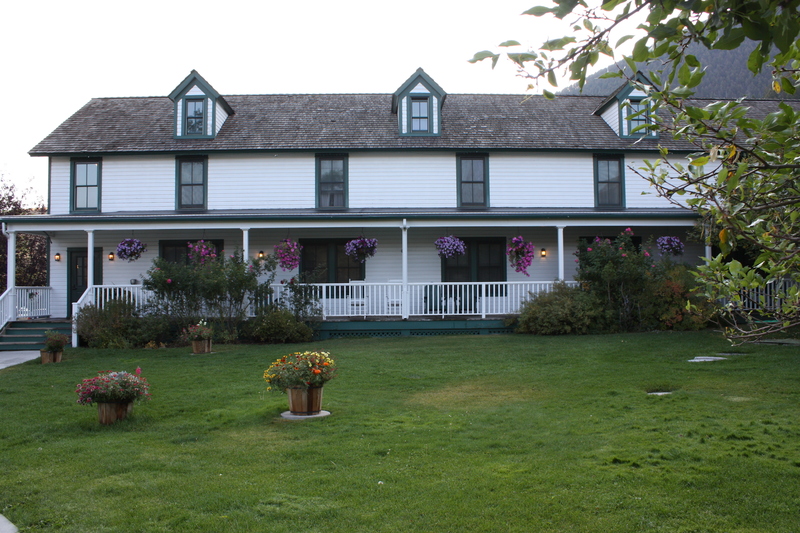 The hotel was built in 1900 and is listed on the National Register of Historic Places. It combines Georgian-inspired architecture and warm Craftsman-style interiors, alongside a great swimming pool and bath house to “take the waters.” Exceptional dining includes fresh vegetables grown in greenhouses heated by the hot water springs. Carriage ride, anybody? 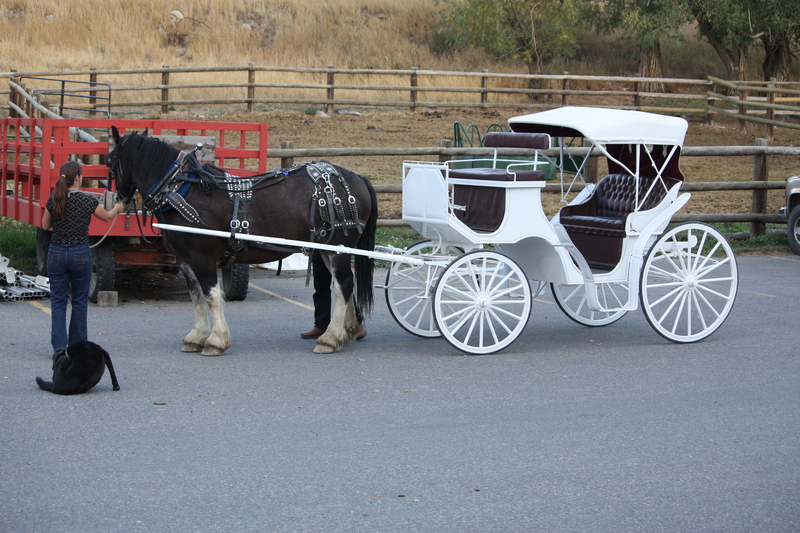 . . . .
Horses have been an integral feature at Chico, and a carriage ride or trail rides are available to guests. I don’t think the black dog is part of the ride, but he looks the part. Can’t rollerskate in a Buffalo herd . . . . 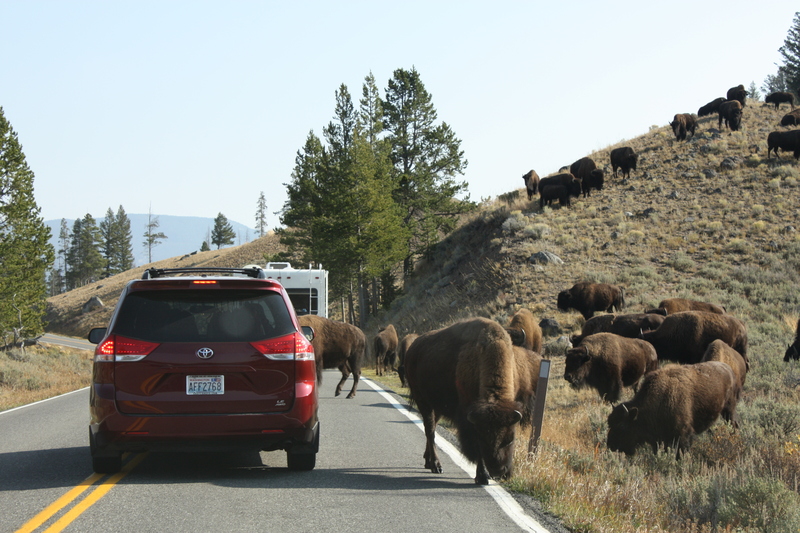 The bison have taken the road and the cars have to fend for themselves. They were in no hurry and dawdled along the roadway, but the drivers of these cars didn’t seem to mind. 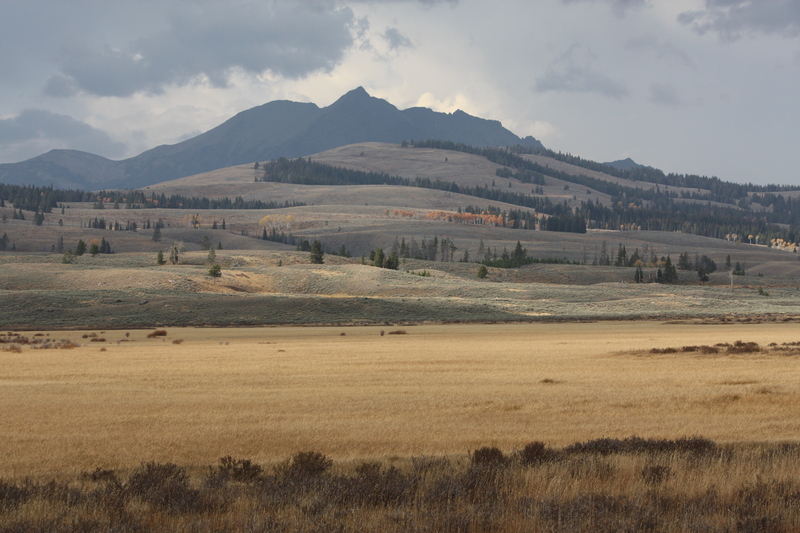 We are back in Yellowstone National Park, driving toward the Lamar Valley. Ready for a dip? 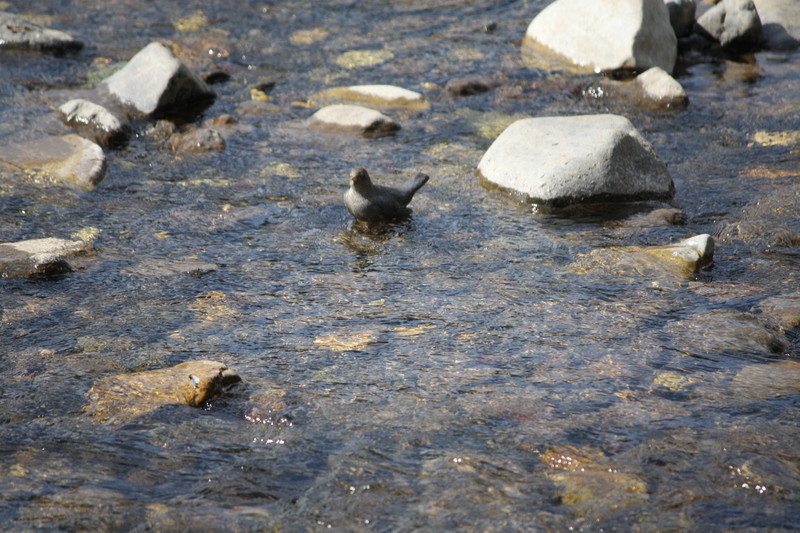 . . . .
An American Dipper (a.k.a. Water Ouzel) joined us for lunch along Soda Butte Creek in the northeast quadrant of the park. Delightful to watch, these birds dive into the water and submerge beneath rocks to forage for food. Usually found along rushing mountain streams, they have become symbolic of our autumn sojourns into the wild, as we have sighted at least one every year for the past three seasons. Underwater espionage . . . . 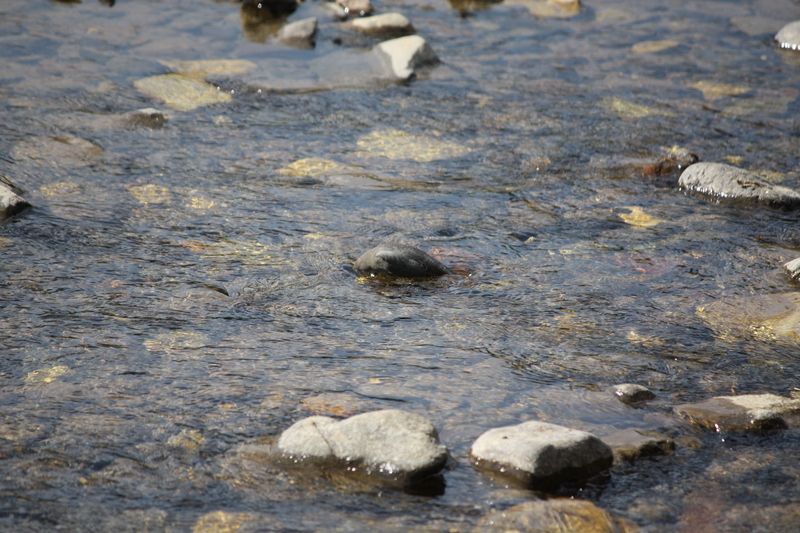 The dipper doesn’t seem to mind the icy cold waters as he trolls for lunch. He darts in and out so quickly that all the physical activity must keep him warm. The show lasted for about ten minutes, and my lunch grew stale while I tried to catch up with this delightful bird on the camera lens. Always in a hurry . . . .
North America’s fastest animal, these antelope have run a complete circle around us and don’t seem ready to stop to think things over. Autumn fire is aglow . . . . 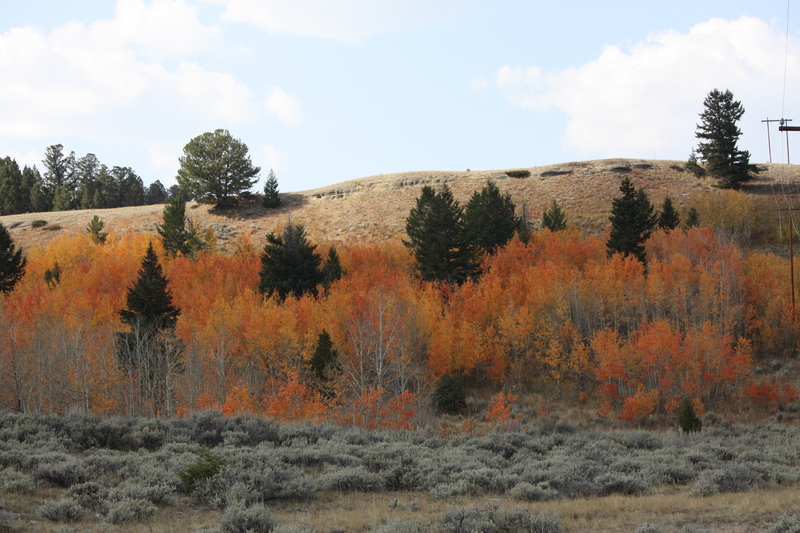 The view from Chief Joseph scenic byway is spectacular and ranges from great valleys to the tall mountain peaks of the North Absaroka Wilderness Range. Shangri La of the West . . . . This view from Dead Indian Pass overlooks the vast expanse of Sunlight Basin upper left and Clark’s Fork of the Yellowstone River below. Named for a member of Chief Joseph’s tribe who was killed by U.S. Army troops, it marks a sad chapter in the history of the West. The beginning of the end . . . .
Our journey leads from Cody, across the Big Horn Basin, and into the Big Horn Mountains. 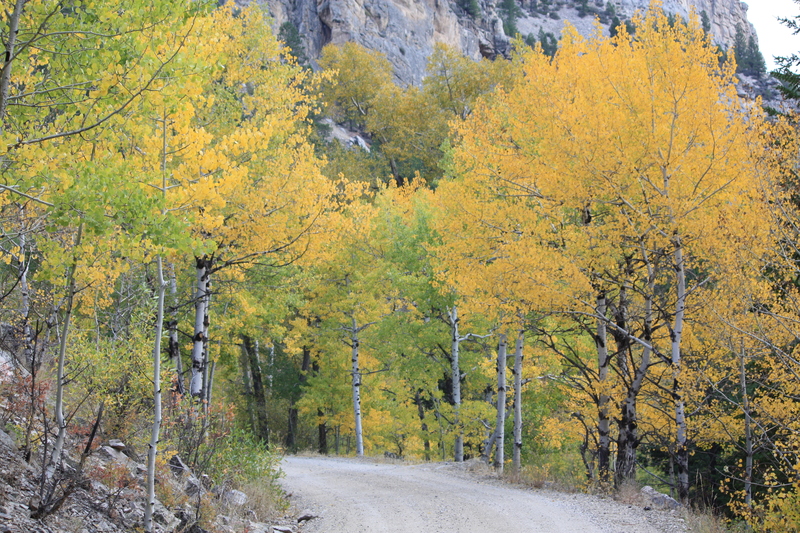 A favorite jeep road down the face of the Big Horns was a sheer delight, as the colors were incredible. 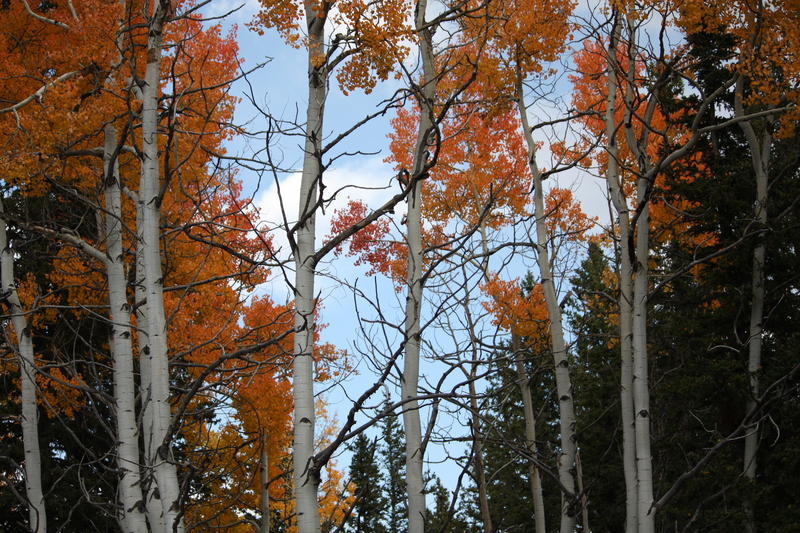 Aspens shimmering in the sun . . . .
We didn’t mind the bumps, rocks, washboard and loose gravel of the road into Crazy Woman Canyon. Actually, the road is in better condition this year than in many years past and we dropped down to view wonderful fall colors and wildlife. The rush and roar is no more . . . . The sounds of Crazy Woman Creek as it winds along the roadway have always been part of the thrill of this canyon drive. In the spring and early summer, it rages and roars from melting snows as it rushes down the mountain. 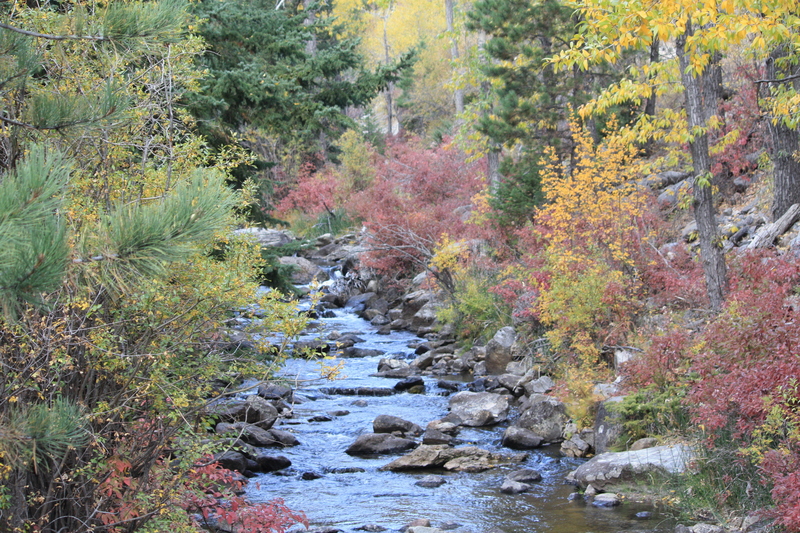 This year a prolonged drought has reduced the creek to a much lower stream-flow. It is still wonderful to hear and see, however. 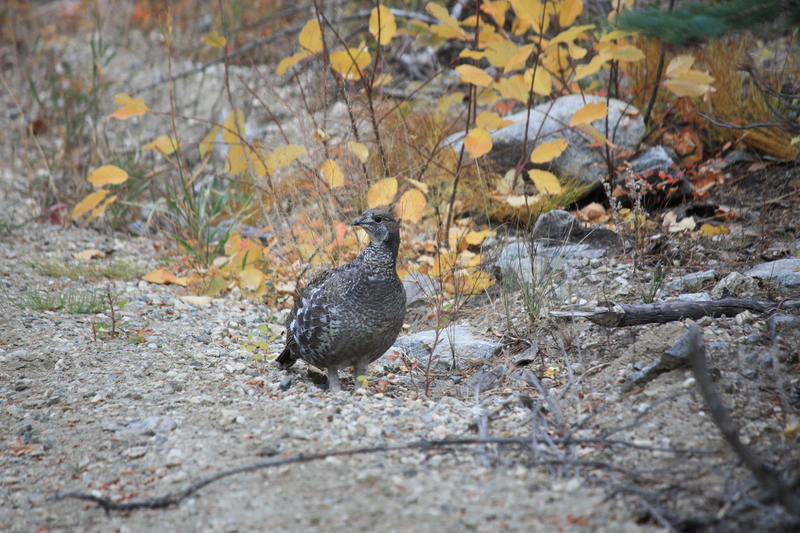 “What is it you want to talk about?” . . . .
A blue grouse seems determined to hold the road for awhile, and we couldn’t believe our good fortune that he waited around for our camera. Highly sought for hunting and eating, it seems a better course of action to just take their picture and let them enjoy life. 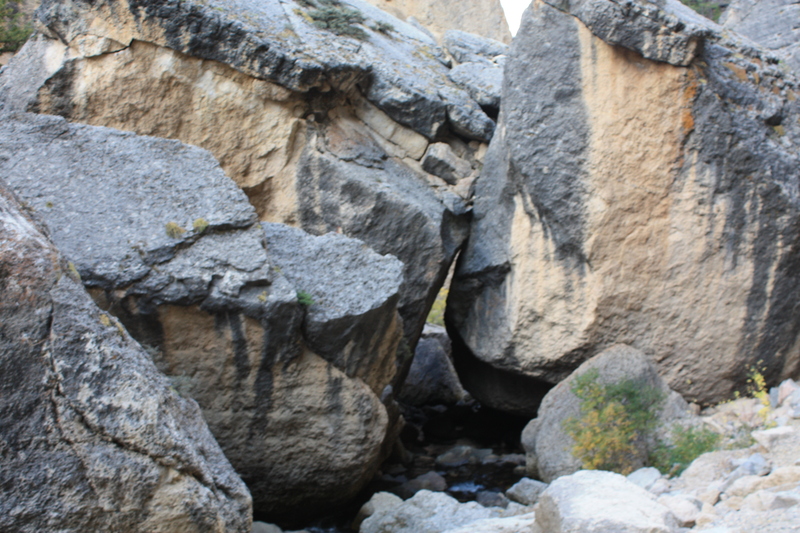 Giant boulders the size of a barn have tumbled to the base of Crazy Woman Canyon and the creek rambles in and out as it rushes to the canyon floor. The one-way road narrows at this point, but we find a little spot for a pullout. Meeting oncoming traffic in the canyon is always a challenge, but this day we met only two vehicles coming up and we seemed to be the only vehicle going down. Autumn leaves, anyone? . . . .
By now we are drunk with spectacular autumn colors, but a few more won’t hurt. Deer crossing . . . . 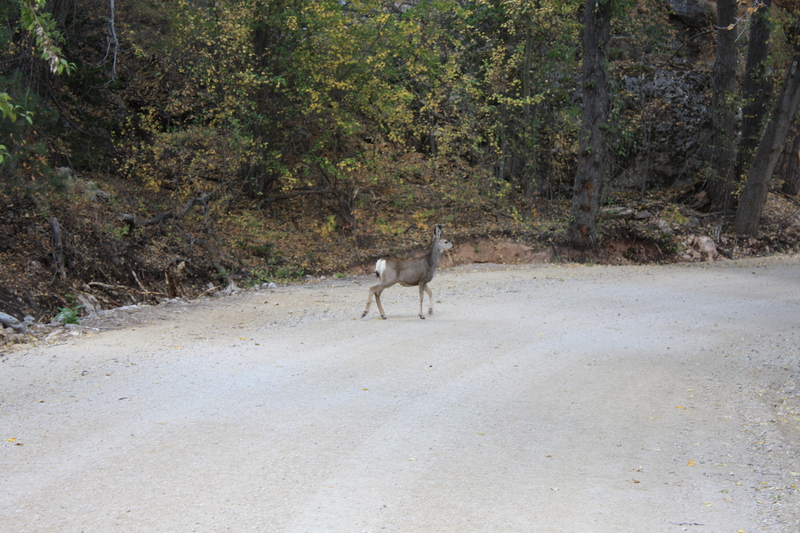 This young mule deer darted across the road in front of us, then hesitated. 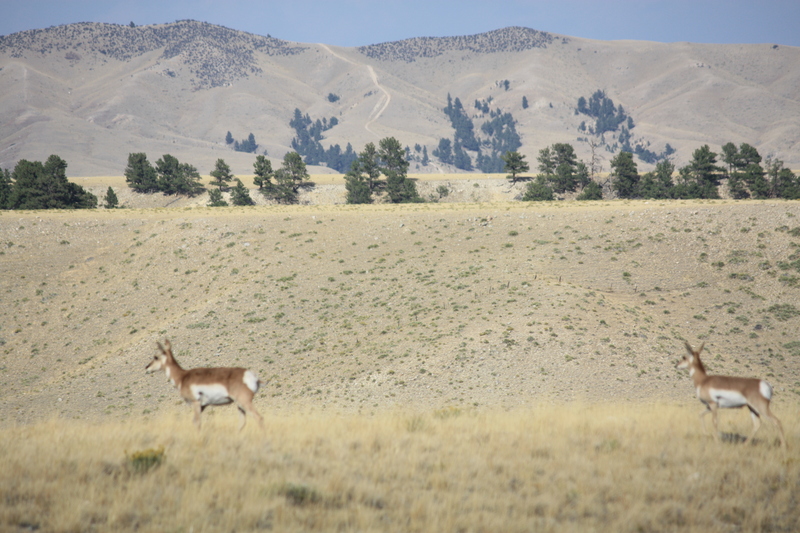 She didn’t seem to know whether to retreat or keep going and she finally opted to leap down into a rocky gulch and scramble up the side of the slope. Here we are without fishing poles! . . . .
Dad never liked to fish this stream. 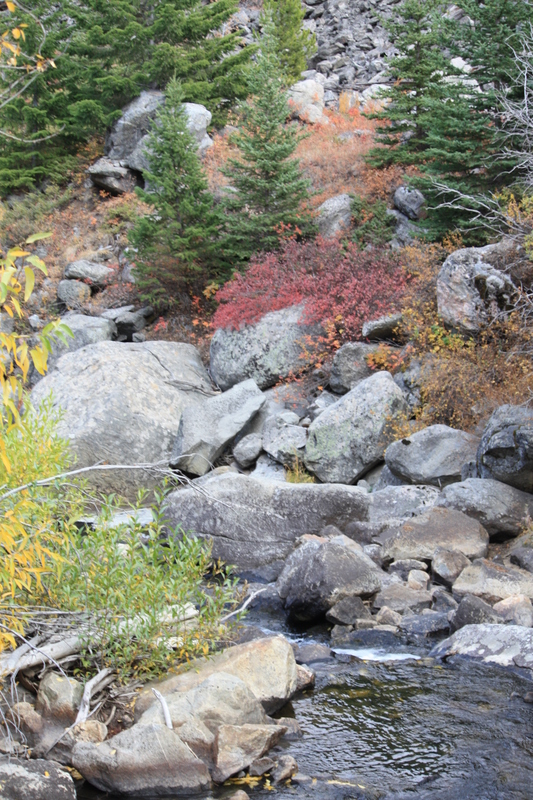 He said there were no fish here, however we suspect the boulders, willows and rugged terrain had something to do with it. Willy takes a break . . . .
To lend some perspective to the size of the boulders, a jeep helps. To have a great journey, a jeep helps. To get great mileage, comfort, and maneuverability, a jeep helps. 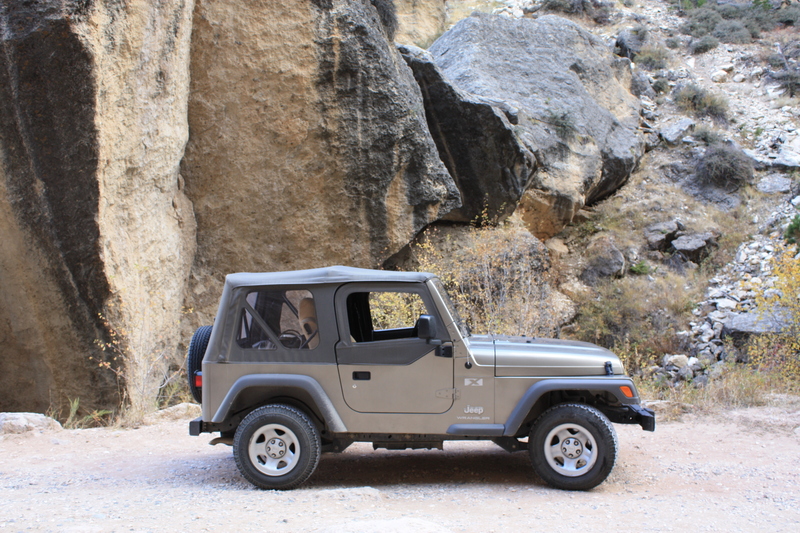 And to get an outdoor experience (doors off, roof rolled back), a jeep REALLY helps. Five days, 1000 miles, and seemingly endless beautiful vistas–Willy made it so much fun. 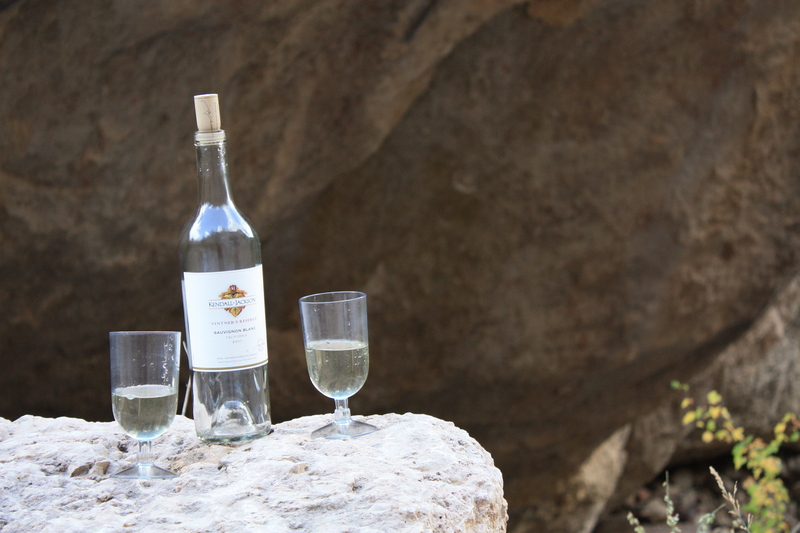 And did we mention wine? . . . .